Camdenton LASER (Laker Afterschool Science, Engineering, and Robotics) 3284 is a FIRST® Robotics team from the rural town of Camdenton, Missouri. After founding the FRC progression in Camdenton, LASER and the Camdenton School District added the FLL, FTC, and FLL Jr. progressions. LASER annually hosts official FIRST® events such as Championships, Qualifiers, Expos, Meets, and off season events. In 2017, LASER was named the Central MO FIRST® Affiliate for FLL® and FLL Jr.®. LASER has started 105 FIRST® teams, mentors 88 FIRST® teams, and assisted over 310 FIRST® teams. In 2018, the Camdenton R-III School District was named 1 of 28 FIRST® Class Schools because of LASER's motivation to grow FIRST®. Through Gracious Professionalism and extensive outreach, LASER continues to promote the message of FIRST® on a local, state, national, and international level. FIRST® knows "that culture shapes our basis and beliefs about people based on their age, gender, race, language, (dis)ability, or income level, often without our realization." 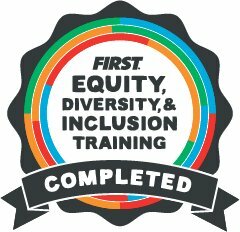 LASER is now 100% FIRST® Equity, Diversity, and Inclusivity Training Certified, to expand the team's awareness of invisible inequities, hidden messages, and how to inspire success of team members.